The new, Retina-display-bearing MacBook Pro was in our offices Monday afternoon. While we'll start lab testing it and getting our review going, I got a chance to poke and prod it for a few hours. Here are some quick initial impressions. First off, this disclaimer: I've been using an 11-inch MacBook Air for so long now, it's very hard for me to judge a 15-inch laptop. It feels enormous to me. But fans of the current 15-inch MacBook Pro will notice that this new laptop is actually quite a bit thinner than the current model, a bit lighter, and slightly narrower. 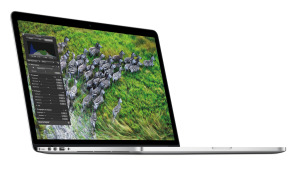 That all said, this is in many ways the 15-inch answer to the MacBook Air. Gone is the optical drive, spinning hard drive, FireWire port, and Gigabit Ethernet jack of past models; instead, it's all solid-state storage, Thunderbolt and USB 3 ports, and HDMI. On the right side of the case, there's an SD card reader, an HDMI port, and a single USB 3 port. Compare this to the previous MacBook Pro, which offered nothing but the slot-loading optical drive. 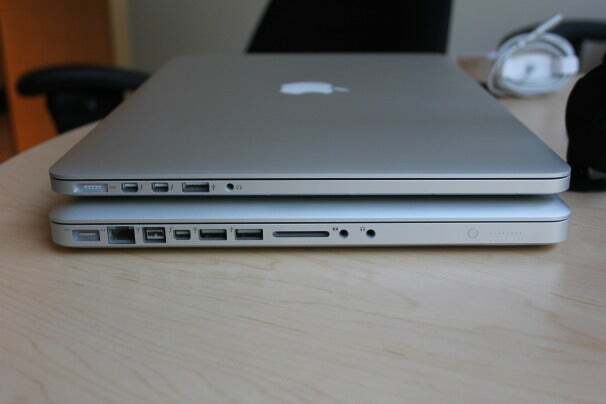 Right side of the Retina MacBook Pro (top) and 15-inch MacBook Pro. The left side, meanwhile, features a small assortment of ports. There's the new MagSafe 2 connector (about which more in a bit), two Thunderbolt ports, a USB 3 port, and a headphone jack. 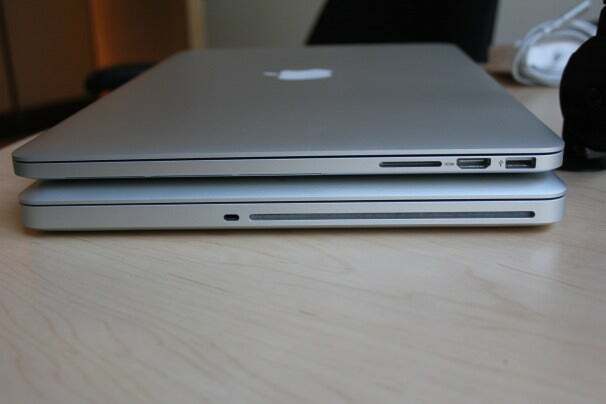 Left side of the Retina MacBook Pro (top) and 15-inch MacBook Pro. And then there's the display, a mindblowing 2880-by-1800-pixel screen that looks like a 1440-by-900 model--except for the fact that there are four pixels for every one on the older display. Just as on the iPad and iPhone, a retina display offers incredibly smooth, clear text and images with startling detail. It's quite funny to view a Final Cut Pro interface with roughly a quarter of the screen taken up with a video preview, only to realize that the video is playing back at full, native 1080p resolution with plenty of room to spare. Pictures are similarly sharp. Web pages display with crisp text but, as on the third-generation iPad, most images on those pages are noticeably jaggy. A small portion of the MacBook Pro interface at full resolution. 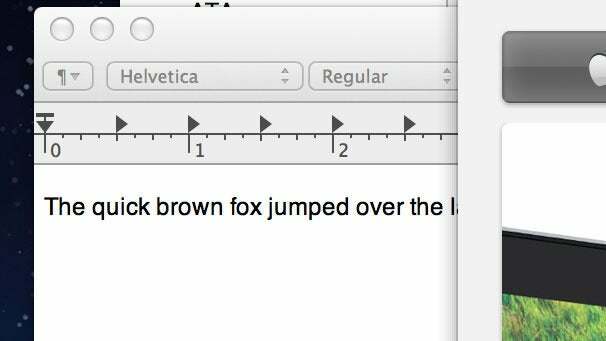 The Displays preference pane on this system (running OS X version 10.7.4, build 11E2617) isn't like those seen on previous Macs. 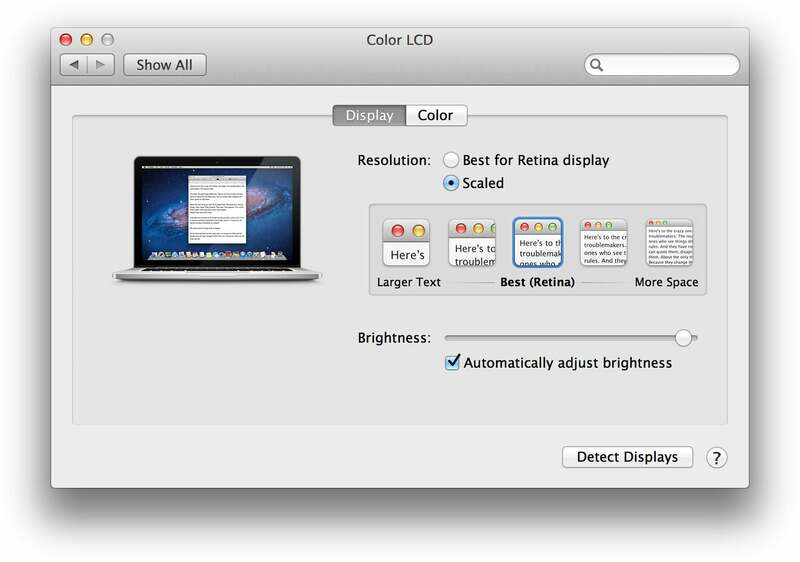 Instead of displaying a list of different screen resolutions, it defaults to a "Best for Retina display" resolution. 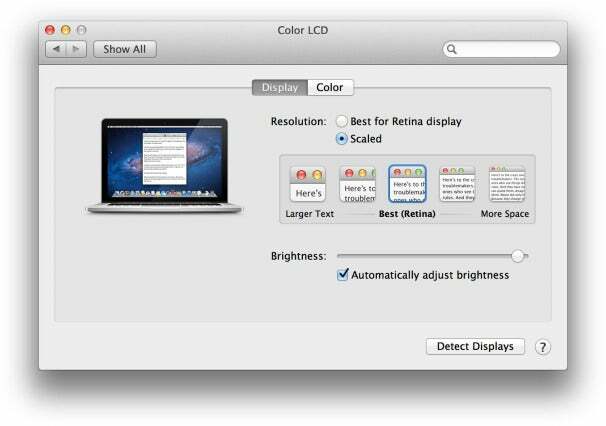 If you choose the Scaled option instead, you can choose from five presets ranging from Larger Text (which makes all the interface elements on the screen larger) to More Space (which makes everything smaller, feeling more like a high-resolution display on previous MacBook Pro models). The new-look Displays preference pane. Then there's the change that will make any IT manager groan: yet another port switch that renders a whole generation of Apple computers incompatible with a whole other generation of Apple computers. In this case, it's the MagSafe power plug, which has evolved into a thinner, wider connector that's completely incompatible with previous models. (Apple is selling a $9 MagSafe to MagSafe 2 converter to address this.) Simply put, the new MacBook Pro is too thin to fit the old MagSafe adapter. So it needed to change. But if you're a family or workplace that's already got a MacBook and wants to add another, freely sharing adapters is off the table. A tale of two MagSafe connectors—version 2 (left) and the previous model. Apple says that the process used to attach the Retina display to the monitor allows less glass to be used, creating less glare. It's hard to tell without more use, but it seems that the new MacBook Pro is more like the MacBook Air (which I don't find particularly glare-prone) than the older MacBook Pros (which seemed quite glarey). That evolution is natural. But then there's the X factor, the introduction of a high-DPI display to the Mac for the first time. Developers will need to update their Mac apps to take advantage of Retina mode. And it'll be interesting to see how users—especially those in creative jobs such as working with photos and video—take advantage of all that screen resolution. Apple's been promising a high-resolution Mac interface for years now, but with the new MacBook Pro the future is finally here. Stay tuned to Macworld for much more on the new MacBook Pro, including lab tests and a full review.